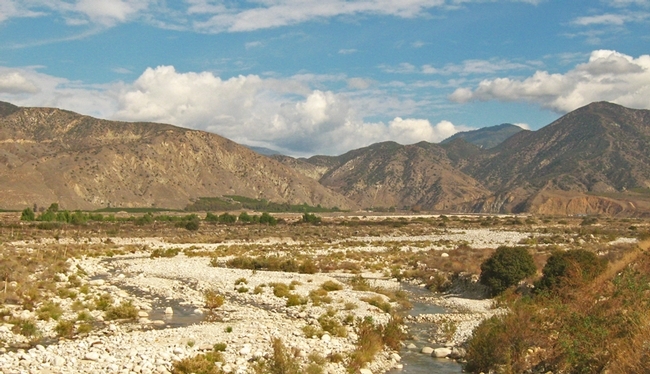 The Santa Ana River along the river trail in Highland, California. Photo by Cyclotourist at Flickr under a Creative Commons li-cense. Valerie Olson, assistant professor, and Emily Brooks, post-doctoral researcher, are environmental anthropologists at UC Irvine. They have a new project aimed at getting a better understanding of how communities, particularly the underserved, think about and use their water, and how the agencies that provide water can better serve them. Can you talk a bit about how your project working with underserved communities and how they use water came about? Our partners at the Santa Ana Watershed Project Authority (SAWPA) wanted to find new, more holistic ways of understanding both the strengths and needs of communities in the watershed. The watershed is facing challenges ensuring there is water for everyone in one of the fastest growing areas of the state. We started working with Dr. Mike Antos, Senior Watershed Manager, on a planning process informed by ethnography, which is a common research practice in anthropology. The idea is that locals are the best experts on their own communities' needs and strengths. They live in and move through these places every day, and have experience and knowledge that isn't accessible to outside experts like water planners. By going out and listening to people, and collecting and representing their stories in their own voices, we are focusing the planning process on what matters most to the people who live and work there. 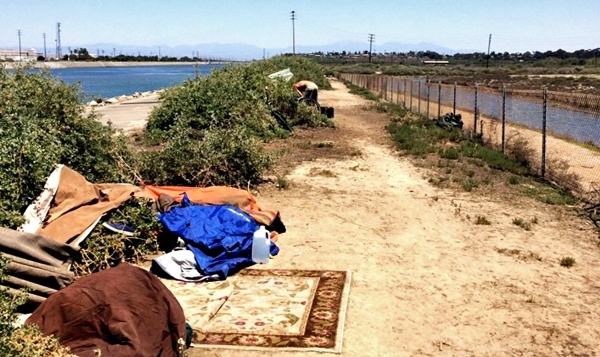 Homeless encampment along the Santa Ana River Trail near Newport Beach. Photo by ltenney1225 at Flickr under a Creative Commons license. Overall, we're trying to make a few interventions at the same time. We're interviewing water agency staff and community members to underscore that water agencies are also part of the communities they serve. We're using stories and narratives to add the people back into reports that are generally based on quantitative data. And we're foregrounding local experience, expertise, and strengths, not just needs. That's a lot of landings to stick in one project, but we think we have the right combination of team and receptive audience. What you are hoping to accomplish with the project? Our assessment will help direct future projects and funding decisions, and our goal is to help identify creative opportunities for water agencies to work with communities that might have flown under the radar. Water agencies have particular assumptions about what underserved or underrepresented communities need. But when we go out and talk to people in those communities, we're hearing a different set of priorities that includes affordable housing, public parks, and roads. The challenge then becomes thinking about how water might fit into those priorities. As an example, could we approach this in a more holistic way by building bioswales or a rain garden in a public park? Another goal with this project is to elevate community strengths as well as needs. We will be asking what people already love and value about their communities, what kinds of resources they already have, and what can be done to strengthen them. Planning for a more equitable future isn't just about solving problem, it's about making sure you can keep the things that matter to people intact and healthy. 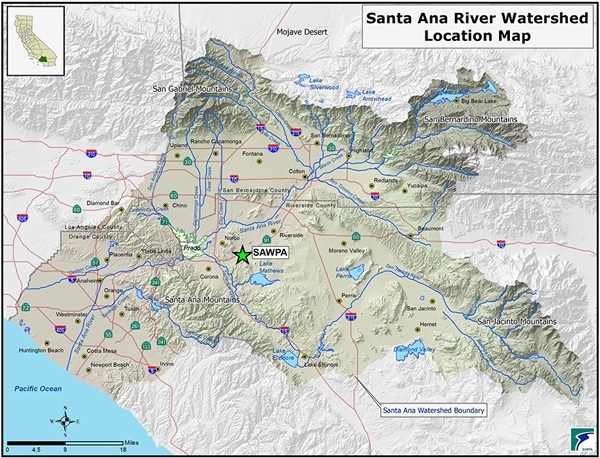 The Santa Ana Watershed spans a large geographic area, including many large cities, of southern California. It begins with tributaries located throughout the area’s major mountain ranges and ends where the Santa Ana River enters the Pacific Ocean. Map courtesy of SAWPA. What are some of the ways that anthropological approaches might help to shed a different light on how we think about water in California?  One of the most exciting parts of this project is the opportunity to design community ethnography, like community or civic science. We're drawing on a few key ethnographic tools – conducting open-ended interviews and listening sessions, working with qualitative data and stories, and taking a ground-up perspective on what a community is and how it works – and using them to build a rigorous research process. We'll then provide training and workshops with our project partners who are each experts on the particular community groups they'll be working with. We hope the process we develop for this project will become something other agencies can use to better listen and respond to the communities they serve. Incorporating what we learn here into processes like Integrated Regional Watershed Management, which already require some form of disadvantaged community engagement, would be a fantastic outcome that would add some much-needed detail to how we understand the way different groups live with water in California. We know a lot about certain water behaviors from certain people – for example, what incentivizes homeowners to take advantage of rebate programs – and almost nothing about others. This project is exciting for us as researchers at a public university because we get to act in our capacity as public servants. We're not just sharing the final results of our research, but really using the overall process to be of service.